This Mediterranean beet salad is very easy to make. 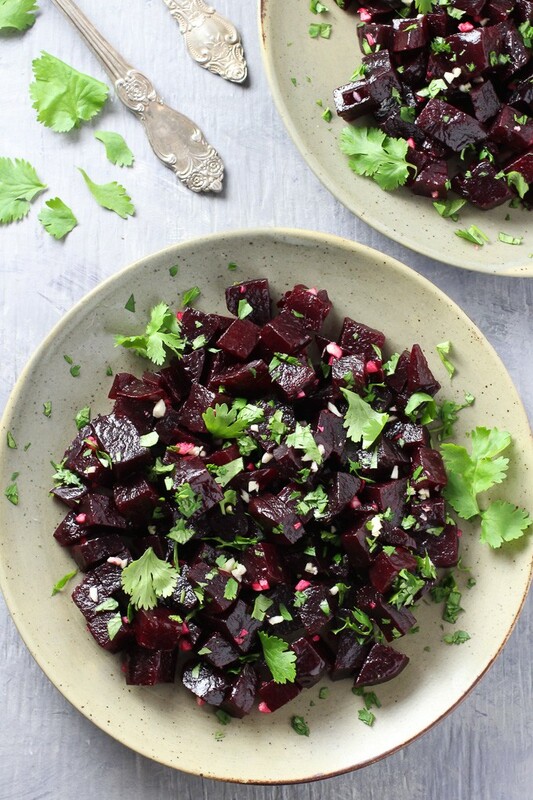 It’s made with cooked beets, garlic, olive oil, sea salt, and cilantro. And if you don’t like cilantro, you can also use parsley or skip the fresh herbs altogether. 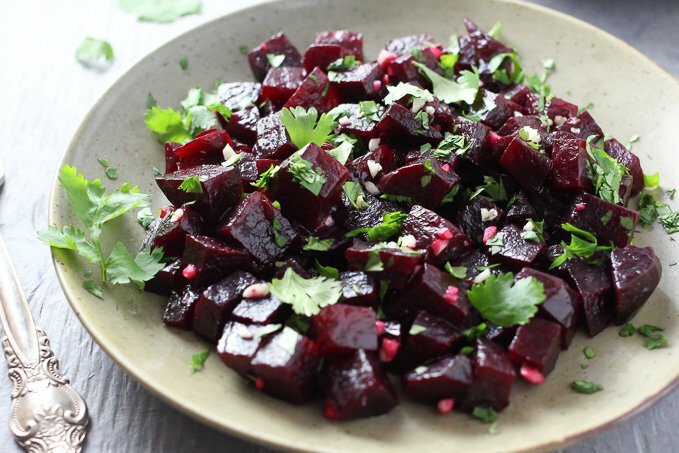 The Mediterranean beets can be served hot or cold and taste great as a side dish or salad. Beets are one of my favorite vegetables. I know many people say that they don’t like beets but I am convinced that they just haven’t tried beets that were prepared properly. Beets are usually very inexpensive and keep well in the fridge. You can buy beets with greens still attached or just the bulbs. If you buy a bunch of beets with greens, make sure to remove the greens because they go bad fast. Beet greens can be used in soups or cooked the way you would cook other greens such as collard greens or kale. Raw beetroot and beet greens make a great addition to fresh pressed juices. You will need cooked beets for this Mediterranean beet salad. There are five ways to cook beetroots. You can roast, boil, steam, steam-roast them, or cook them in the microwave. There are brief instructions in the recipe section below. 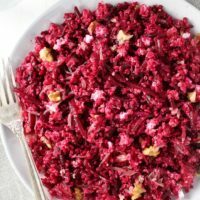 For detailed cooking techniques as well as tips and tricks on how to buy, prep, and store beets, check out my post How to Cook Beets: 5 Easy Methods + Tips and Tricks. To make sure that the beets are fully cooked insert a fork into the beetroot. You should be able to easily pierce them, and the fork should very easily slide back out. Beets take a long time to cook. That’s why it’s better to choose medium-sized beets and make sure all the beets you are cooking are similar in size. This way they will be done all at the same time. I usually leave them to cool in the oven because beets are very hard to handle when they are hot. Also, make sure to wear gloves if you don’t want any stains on your hands. There are so many ways to serve cooked beets that I probably could write a cookbook just with beet recipes. 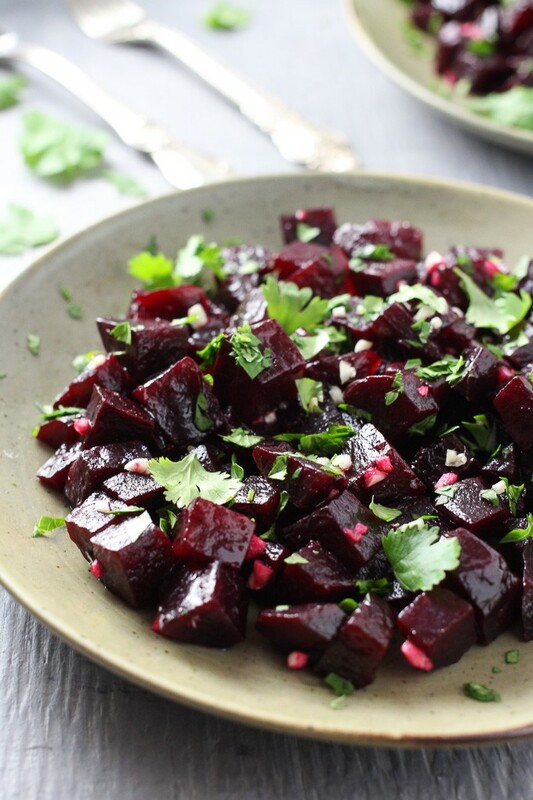 To start, try this Mediterranean Beets with Garlic and Olive Oil. It’s very easy to make and so good for you! 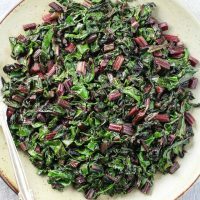 Also, make sure to check out this Detox Kale and Beet Salad, this Beet Quinoa Salad with Goat Cheese and Grapefruit, and this Beetroot Soup with Beans. 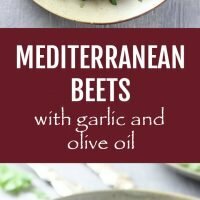 These Mediterranean Beets with Garlic and Olive Oil are really easy to make. They are full of flavor and very healthy. Serve as a salad or side dish. 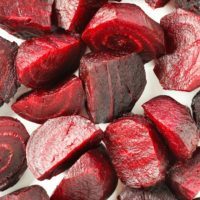 To roast the beets, place them on a baking sheet and roast in the oven at 400 F for one hour or until you can easily pierce them with a fork. To boil the beets, place them in a pot. Add water ( make sure the beets are fully covered with water). Bring the water to a boil and cook the beets until you can easily pierce them with a fork. It may take over one hour depending on the size of the beets. Note that the beets might stain the pot. To steam-roast the beets, place them in a baking dish. Add about 1/4 to 1/2 inch of water. Cover the baking dish with aluminum foil making sure the foil doesn’t touch the beets. Place in the oven and roast at 425F for about 50 minutes to 1 hour or until you can easily pierce them with a fork. Peel and chop the beets. Place them in a bowl. Add chopped garlic, olive oil, and chopped cilantro. Sprinkle with sea salt. 1. 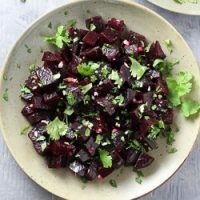 For the detailed instructions on different methods of cooking beets, check out How to Cook Beets: 5 Easy Methods + Tips and Tricks. 2. Nutrition information is a rough estimate for 1 serving. 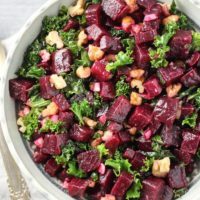 The kale and beet detox salad sounds like just what I need. But the recipe above doesn’t list kale. Shall I just buy baby kale and add the Mediterranean oil, garlic beets? If you don’t like cilantro, what can be used as a substitute? I sometimes use parsley instead of cilantro. Looking forward to beetroot hummus. 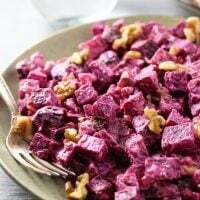 Hi Maria, I just read about your beet receipe, and I wanted to know if you cook the garlic with the beets? Hi Helen, no I use raw chopped garlic. Hello….if you served as a side dish, would you reheat the beets or leave cold? Hi Annie, in this dish I just leave them cold. 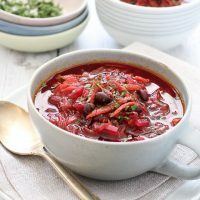 Thank you so very much for posting this recipe. I just bought some beets at the grocery and just wanted something different than shredded beets, shredded carrots with a squeeze of lemon juice. Or the typical baked beet. It just so happens I have all of the ingredients and this will be my lunch today. *On a side note I was looking for a healthy recipe using fresh ingredients and garlic. The garlic because in winter sometimes I get a very bad sinus infection. I’m bookmarking your page right now. Hi there! I am so glad you like the recipe. Thank you so much for taking the time to write the comment! It made my day!